By default when you book back a return, the return takes the vessel from the original dispense. In some situations this is not practical, so there is now a feature on CPC that allows you to select the vessel during the return booking in process. While on the return booking in screen (R003), there is a new button on the left side which allows the operator to cycle through the available dispense vessels, from smallest capacity to largest capacity. 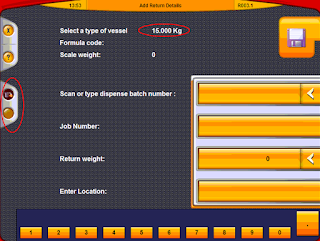 The current vessel capacity is displayed at the top of the screen. The selected vessel will be saved as the return’s vessel when pressing the save button. This feature is available from version 1.9.20, upgrade is free for all customers with a remote support contract. Contact Rexson to arrange an update.